Storm is a distributed realtime computation system, which provides a set of general primitives for doing REALTIME computation. Storm makes it easy to reliably process unbounded streams of data unlike what Hadoop did through batch processing. Note: Storm cares about consuming streaming of data and processing these streams in arbitrarily complex ways, not about data state and storing. topology: the way spout and bolt compose. 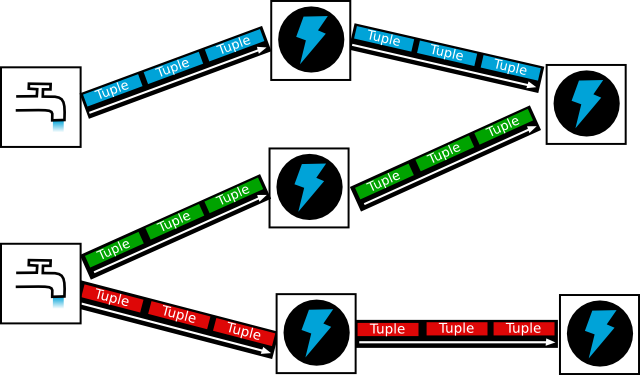 In a storm cluster, nodes are organized into a master node that runs continuously. The master node has an alias name of Nimbus, which is responsible for distributing code around the cluster, assigning tasks to each worker node, and monitoring for faulures. Worker nodes run a daemon called Supervisor, which executes a portion of a topology. Worker nodes are run across on different machines. Storm keep all cluster states in Zookeeper or on local disk. Underneath, Storm makes use of zeromq. If you’ve ever tried doing real-time processing from scratch, you’ll understand how painful it can become. With Storm, complexity is dramatically reduced. It’s easier to develop in a JVM-based language, but Storm supports any language as long as you use or implement a small intermediary library. The Storm cluster takes care of workers going down, reassigning tasks when necessary. All you need to do in order to scale is add more machines to the cluster. Storm will reassign tasks to new machines as they become available. All messages are guaranteed to be processed at least once. If there are errors, mes- sages might be processed more than once, but you’ll never lose any message. Speed was one of the key factors driving Storm’s design. You can get exactly once messaging semantics for pretty much any computation. Run on local machine in a single JVM for development, testing and debuging. Run on Storm cluster, that is, in production environment. Note: focus in local mode, which means that the development and test topologies are completely in process on local machine. Nimbus is my computer. Now I am about to create an empty topology (no spout, no bolt) and then submit it to nimbus (local machine), print the cluster instance. Add [storm "0.9.0.1"] to :dependency in project.clj. Run lein deps. In main function, I create the topology and a LocalCluster instance. In conjunction with Config instance, LocalCluster allows us to try out different cluster configurations. I create the topology using a TopologyBuilder. In addition, spouts and bolts are defined via topology. I’ll explain it later. As mentioned before, storm comes with a Clojure DSL for defining spouts, bolts, and topologies. ["a little brown dog" "the man petted the dog"
To define a topology, use the topology function topology takes in two arguments: a map of “spout specs” and a map of “bolt specs”. Each spout and bolt spec wires the code for the component into the topology by specifying things like inputs and parallelism. $ lein run -m api-monitor.main "hi"
java.lang.IllegalStateException: Attempting to call unbound fn: #'backtype.storm.util/some?